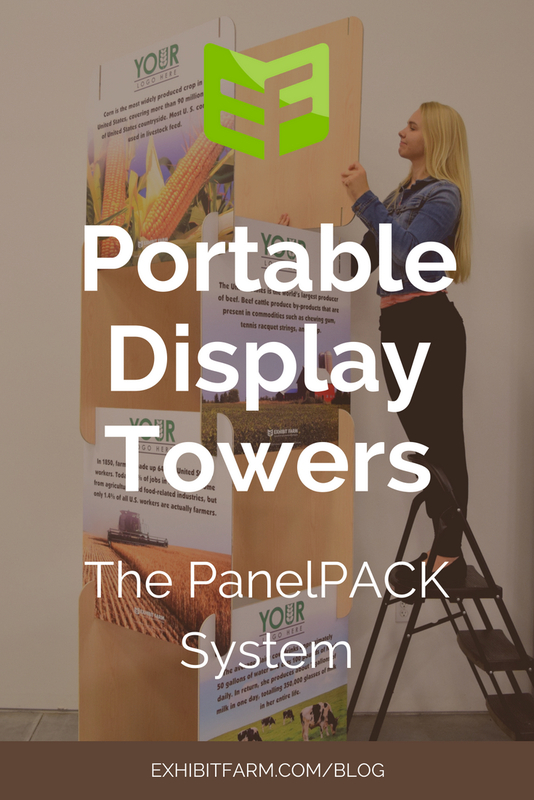 The Indiana Farm Bureau wanted something tall, portable, and easy to assemble for their Indiana State fair display. So we engineered portable display towers: a set of clean-cut plywood panels that stack on top of each other. Each panel features high-quality images and fun facts about agriculture. It’s always exciting when we get to come up with creative solutions for our clients within the agricultural community. But some of the most exciting work we’ve done as the Exhibit Farm team has been for traveling exhibits. 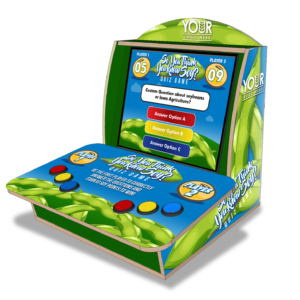 Simply because these exhibits have to be portable, we get to really test our own creativity. We have to come up with units that are practical and easy to assemble and move—all at once. But, at the same time, they also have to look good. 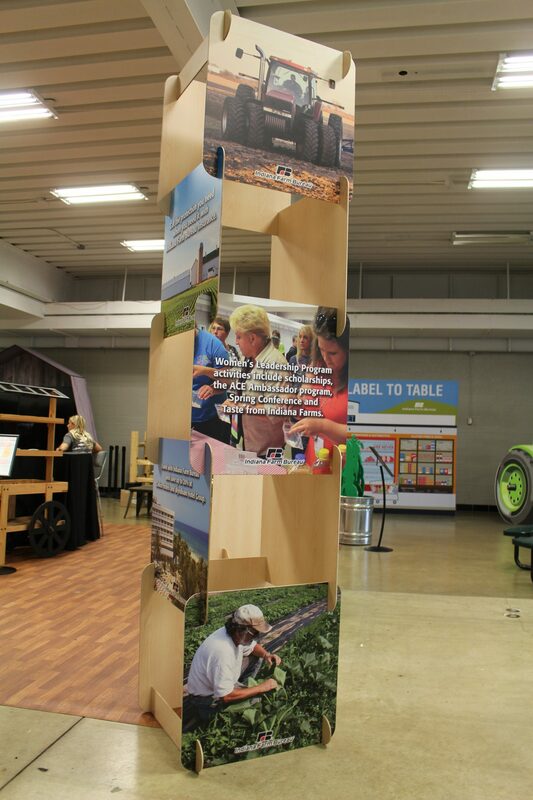 The stacking towers we made for the Indiana Farm Bureau fair display fit the bill exactly. And we’re pretty proud of them. The Indiana Farm Bureau was looking for something that would be tall enough to fill the big indoor space that they have at the fair. They also wanted something that would travel easily and be simple to assemble. And that’s why we came up with a stacking panel tower. It’s got all of those qualities. Plus, it even presents the desired information in a way that is aesthetically pleasing. That’s a definite “must” when it comes to display elements. This exhibit element consists solely of ten square plywood panels and four small stabilizing boards. 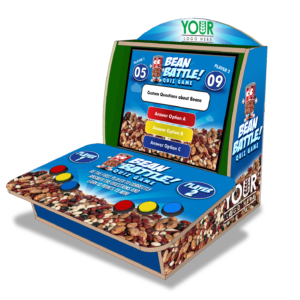 Each panel has rounded corners, notches, and printed graphics. And the notches at the four corners of each panel latch into the notches of the other panels. This way, they can all stack on top of one another. The folks with the farm bureau don’t need any tools to put this thing together. The only thing they might need is a ladder, and they’ll only need that if the final few boards are too high for the person assembling it to reach. After assembly, the tower reaches over eight feet in height. 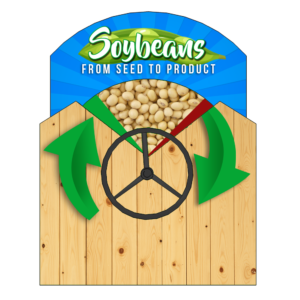 The final disassembled product is easy to carry, transport, and set up, making these portable display towers the perfect addition to temporary or traveling agriculture exhibits.